You will find that having the ultimate Easter egg hunt party for hundreds is cheaper than you thought. 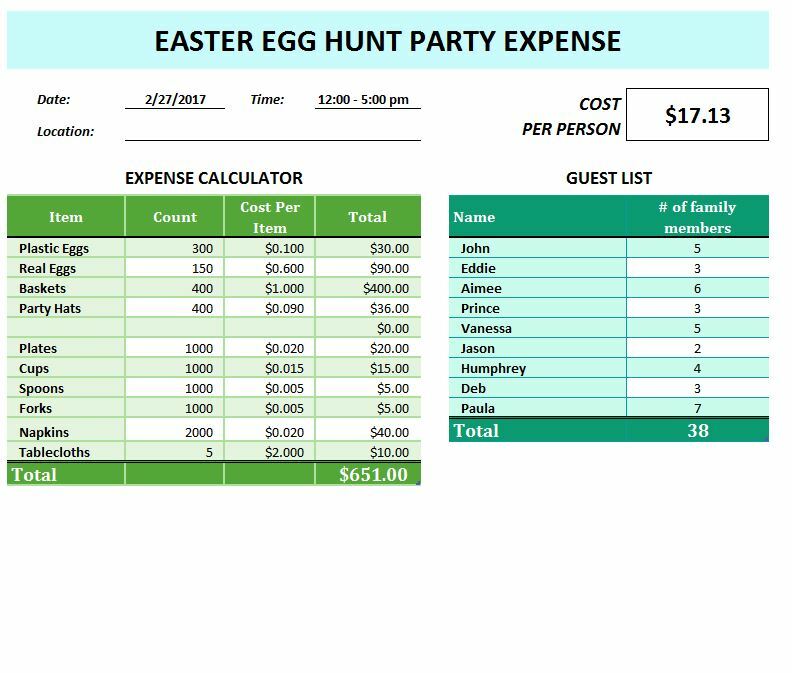 The free Easter Egg Hunt Party Expense template allows you to get together with your friends and family to pool your money together for fabulous prizes! This will be an Easter that the kids won’t soon forget. The free document even calculates all the information for you so you know how much each person will need to contribute to the part. All you need to do to get started is download the free template and follow the simple set of instructions given below. You will start by clicking the link at the bottom of this page that we have provided for you to download the template file. 2. For this step, you will simply enter the name of the guest and the # of family members arriving with him/her, pretty simple, right? 3. Under the expense calculator table, enter the name of the items bought, the count of items, cost per item (if available). If you enter the cost per item, then the cost for that item will be automatically calculated, else enter the total manually. 4. The total cost at the bottom will be automatically calculated. If you scroll back to the top of the page, you will see that the template also breaks down how much the cost would be divided by each person attending the party. This template just makes it easier for people to plan the party they want because it makes Easter affordable again.